To speak with an Enrollment Counselor, contact us at (207) 221-4143 or socialworkonline@une.edu. Ready to begin an application? Visit the application portal today! Applicants are encouraged to review the admission requirements for each track prior to beginning their application as the admission requirements vary for each track option. Please visit our Admissions page. for a full list of admissions requirements. Can I apply if my GPA is lower than 3.0? 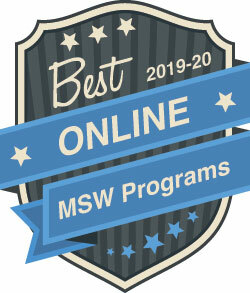 Applications for the MSW online program are reviewed holistically. Applicants who do not meet the minimum GPA requirements can still apply, however applicants are encouraged to strengthen their application in other ways such as by addressing their low GPA in a supplemental essay or through a phone interview with the admissions committee. The GRE is not required as part of the admissions process. If you have taken the GRE, you are welcome to provide your score as part of your application package, but the GRE it is not a requirement. Will this degree be recognized in my state? This program is aligned with State of Maine social work licensing requirements. Because licensing requirements vary by state, we encourage you to research the requirements for the state in which you intend to practice. For more information, download a list of state licensing boards. Applications are accepted on a rolling basis three times per year. The online Master of Social Work program runs year-round with three terms per year: spring (January-April), summer (May-August), and fall (September-December). Each term consists of two 8-week sessions. No, this program is completed 100% online with no campus visits required. What are the requirements for the Master of Social Work degree? Our Traditional Standing program, for students who do not possess a Bachelor of Social Work, consists of 64 credits (20 courses and 2 field practicums). Our Advanced Standing program, for students who do possess a Bachelor of Social Work, consists of 35 credits (11 courses and 1 field practicum). Degree requirements, course plans, and curriculum framework differ for each. For more information, please visit our Degree Requirements page. To be considered full-time, students must take at least one online course per eight-week session. There are two 8-week sessions per term, and three terms per year (Summer, Fall, and Spring). The online MSW program offers three terms per year, allowing students to complete six to 12 courses per year. Will I be able to choose a specialization for my MSW degree? Yes, the flexibility of our MSW program helps you meet your specific personal and professional goals with three specializations to choose from when designing your educational course plan: Clinical Practice, Community Practice, and Integrated Clinical/Community Practice. For more information, please visit our Degree Requirements page. For the best outcomes, it is recommended that students reserve approximately 15-20 hours per week for coursework and studying; this will increase when you enter field placement. For additional information, see the Field Placement section of this FAQ. C﻿an I complete the Master of Social Work while working full-time? Although this program is specifically designed with the working professional in mind, the Master of Social Work program requires internships that will take place during the traditional work week. How many field placements are required? For Traditional Standing students, two 560-hour field placements (the first completed at end of generalist coursework and the second at the end of specialized coursework) are required. For Advanced Standing students, one 560-hour field placement (completed at end of advanced coursework) is required. For additional information regarding field placement, please download our field planning FAQ. How many hours will I complete during my field placement? All students are expected to complete 560 hours per field placement. This averages 18-20 hours a week. Students need to be in placement for a minimum of 18 hours/week. This includes the 60 minutes/week of field instruction. Students must attend the organization’s staff meeting and plan to be at the site a minimum of 8 hours during regular business hours. For additional information regarding field placement, please download our field planning FAQ. Our motto is "A successful student is a supported student." Upon entering the program you will be assigned a dedicated Student Support Specialist to provide you with support and to answer any questions you may have. Your Support Specialist is your on-the-ground advocate at the University – from questions on textbooks to registration to financial aid and more, they are there to help you make your academic journey successful. And of course, this dedicated support is provided in addition to the tremendous support you will receive from program staff, your academic advisor, course instructors, and fellow classmates. For additional information on student resources, please visit our Student Support and Resources page. Is the Master of Social Work program accredited? 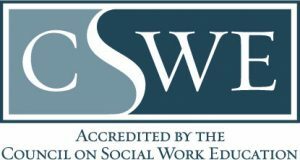 Yes, UNE’s online Master of Social Work program is accredited by the Council on Social Work Education (CSWE), which is recognized by the Council for Higher Education Accreditation as the sole accrediting agency for social work education in the U.S.
What is CSWE accreditation and why is it important? The Council on Social Work Education (CSWE) is a nonprofit national association representing more than 2,500 individual members, as well as graduate and undergraduate programs of professional social work education. This partnership of educational and professional institutions, social welfare agencies, and private citizens is recognized by the Council for Higher Education Accreditation as the sole accrediting agency for social work education in this country. Please visit our Tuition and Fees page to learn more about the costs associated with our MSW program. Video capability is required for this program. For a full list of additional technical requirements, please visit our Technical Requirements page.